In recent years, the name of the game was to be as sleek as possible. Clean lines, muted color palettes, and a lot of white paint was the modus operandi. Homes looked like something out of the Google office, or any Silicon Valley tech company. This lasted for a while but eventually people started to add interesting combinations of rustic accessories to modern styling. It has been a hit and has opened up a whole new avenue for interior designers and design minded homeowners. Influencers like Chip and Joanna Gaines have certainly helped push this styling into the mainstream and it’s easy to see why. Their tasteful mixes of rustic and modern styling appeal to a broad audience and not to mention their incredible camera presence. 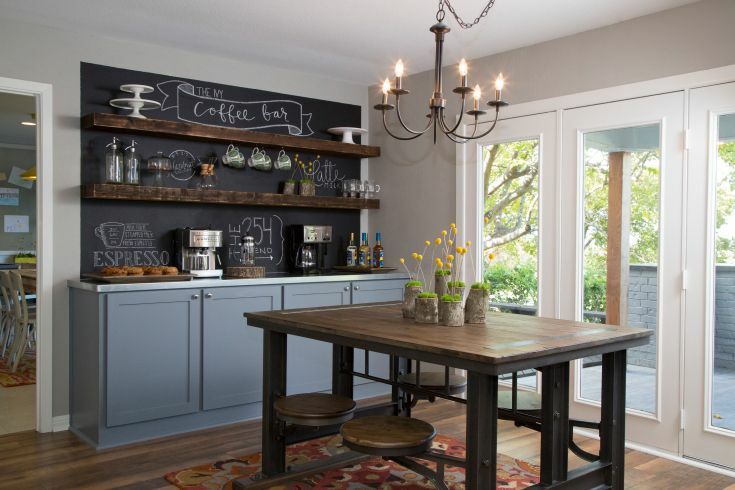 The sleek lines of the breakfast bar cabinets go incredibly well with the rustic style table and shelves. This trend seems destined to stay as there are an infinite amount of combinations one can come up with. See what you can come up with by mixing mid-century modern, shaker, farmhouse, urban and modern styling in spaces of your home. One quick word of advice, try to keep a consistent color palette when mixing styles. The muted color palette is no longer king! Since pantone announced greenery as their color of the year, people have been flocking to mix and match much brighter colors in their spaces. It allows for more personality to be shown through the room and gives it a much homier feeling. Exposed wood is hot right now! Add a nice mashup of modern and rustic styling to your home with exposed beams, shiplap walls or even some nice butcherblock countertops. It relates back to my first trend for this post, the mixing of modern and rustic styling. By adding more woody tones to your space you add character and it is a nice classic touch to any space! Design trends change constantly and it can be hard to keep up, but these three are here to stay for the foreseeable future.